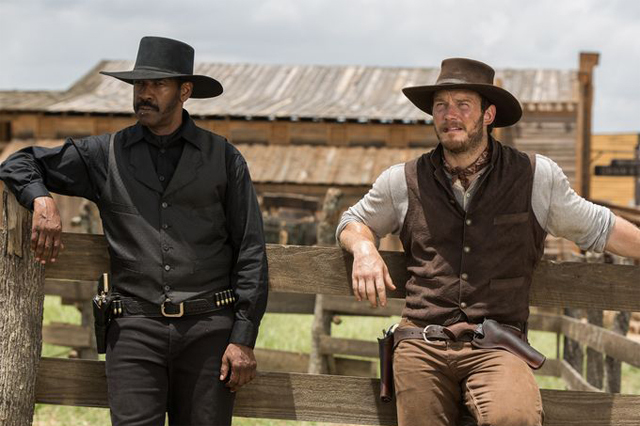 With time on my hands New Year’s Day, I finally bit the bullet and watched Antoine Fuqua’s “The Magnificent 7” reboot, with Denzel Washington subbing for Yul Brynner, Chris Pratt standing in for the ’60s hip Steve McQueen, and Peter Sarsgaard sadistic-to-simpering land baron a lackluster (but marginally more politically correct) substitute for Eli Wallach’s flamboyant bandit chief, Calvera. Obviously sensitive to the fact that the John Sturges-directed “Mag7,” loosely taken from Kurosawa’s “Seven Samurai” and released in 1960, treated its Mexican villagers patronizingly as cowards/ weaklings waiting to be delivered from marauding bandits by mostly white guys, Fuqua recast his mercenaries as a multicultural Wild Bunch — there’s one Hispanic, one Native American, one African American, one Asian/South Korean. Haley Bennett’s soon-widowed townsperson goes in search of the gunmen-savoirs and joins them in the fight. She becomes the eighth member of the team. Verdict: this long-rumored, frequently delayed re-imagining is not terrible, thanks mainly to Ethan Hawke’s war-weary sharpshooter (a mashup of the Robert Vaughn / Brad Dexter characters?) and the late James Horner’s main theme, which is rousing enough but no match for Elmer Bernstein’s iconic Marlboro Man music, reprised briefly over the end credits. In rust-brown appearance as well as offhand staging of the gunfights, Fuqua’s “Mag7” is much closer to operatic Sergio Leone than choreographed Sturges. Makes sense. The Sturges Western, initially dismissed by critics, would be a major influence on the spaghetti Western. This entry was posted on 01/02/2017 at 11:26 AM and is filed under Home. You can follow any responses to this entry through the RSS 2.0 feed. You can leave a response, or trackback from your own site. Always fascinating to read your take on everything…YOU are brilliant. I continue to be a fan of the original. I saw it many times when I was a kid, & also its many versions (though not the sequels). Denzel is great in everything, but after Equalizer & Hateful 8, I was quite done with the westerns & stylized Denzel action films for a bit. I meant that westerns, in the context of Hateful 8 (& Equalizer, about stylized Denzel action pics). Not Worst Film of 2016 | CinemaDope <Liked it!